On Wednesday, at the Companyâs Corporate Offices in the Lewis Building on James Street, Marketing Manager Juno DeRoche handed over the money to two of the âTalkathon Promotionâ winners, Scottie Baptiste and Karen John. Brithney Knights is the other winner, but she is currently out of the island. 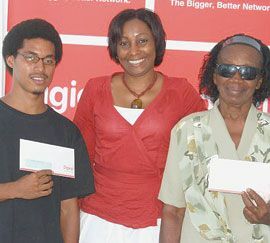 Receiving her cash, John, who hails from Belmont, said that she has been using Digicelâs services for a few years now, âso I feel very good about receiving this money. I would like them to continue the good work.â She revealed that she usually calls her daughter in New York âa lotâ. Meanwhile, Baptiste (Owia resident) said that he is âexcitedâ and could think of nothing to do with the EC$500 at this point in time. Smiling, the mechanic said: âI never won anything before in my life, so I would like to say thanks to Digicel.â He added that the majority of his calls are local. The âDigicel Talkathonâ promotion rewarded the top three talkers who used their phones the most between midnight Thursday, September 17, to midnight Friday, September 18. Marketing Manager DeRoche revealed that three more winners will soon be announced during a âTalkathon Two Promotionâ.